I have an MFA in Photography. I tell you this because, obviously, it’s really very impressive. But also to prove my know-how in the metaphor I’m about to illustrate: Waiting is a lot like standing in front of the developing tray in a darkroom. From the Christian’s perspective – that before God formed us in the womb, He knew us – the film has already been exposed, developed, transferred to paper, and then set apart as a piece of incomparable and beloved craftsmanship. But as the photographer stands alone in the dark, gently rocking the tray of the developing bath, she cannot know exactly how things will turn out on paper. Will the photograph be over-exposed? Scratched? Improperly framed? Or just a throw-away image altogether? We stand eager and anxious for the final resolution. Aren’t we all in this holding pattern to one degree or another? On a macro-level, what will become of our country and society in the awful and turbulent days to come? On a micro-level, we long for the end of our personal tragedies and traumas – for the things in our lives that have gone wrong to finally go right. For me, today, that inexhaustible wait is for physical healing. With sores on my knees from kneeling, and an ache in my heart from what sounds a lot like silence, I’ve wrestled with God like Jeremiah: “We hoped for peace but no good has come; for a time of healing, but there was only terror…Is there no balm in Gilead? Is there no physician there? Why then is there no healing for the wound of my people?” (8:15, 22). Two years ago, I wake up one night feeling short of breath and tight in the chest. As I lie there half awake, half perturbed, I vaguely remember a medical infomercial featuring Rosie O’Donnell talking about the confusing symptoms of heart attacks in women. “Am I having a heart attack?” I wonder nervously. The thought makes my chest even tighter. I try to recall the symptoms. I call my dad, who is a doctor and convenient in moments of abject horror. It’s the middle of the night, but he answers in case of emergency. “Charlotte?” This is always how Dad answers the phone when I call at odd hours. “Dad, something’s wrong,” I whisper (we are in a hotel from a wedding tonight, and our ten-month old baby is blissfully asleep five feet away). “What’s going on?” Dad asks. “Does it hurt on the right or the left side?” he asks. Something under my rib-cage begins to violently contract. I grab my bra. It’s Go Time. “8?” But I want to say “IT’S A 10 YOU ASSHOLES, NOW CUT ME OPEN AND MAKE IT STOP!” But then I would have looked weak (in the event that this was actually just a severe case of flatulence). Eventually I am given morphine or something like it, and the pain begins to subside. Dr. Snowman (His real name. I know – whimsical right?) eventually says, “This looks like a classic gallbladder attack. Make sure to get an ultrasound this week to see if you have gallstones. If so, you might need to have your gallbladder removed.” My throat cramps and my shins begin to sweat. “Oh, don’t worry, it’s a really easy procedure. 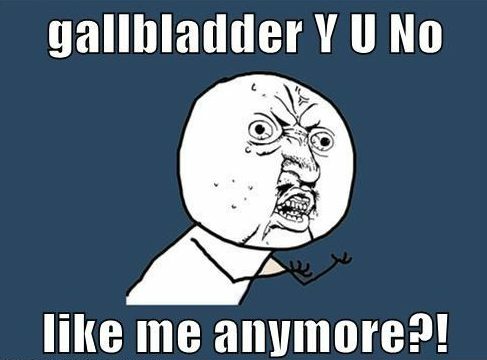 Your body doesn’t even really need a gallbladder! It’s a quick recovery. You’ll get to pick the date and everything!” As if there were cotton candy involved, too! Later that week, I get an ultrasound. Gallstones. The thing will have to be removed. I will “eat healthily” and two months later, on July 31st, cheerily go under heavy sedation and then wake up an organ short and none the worse. Easy. 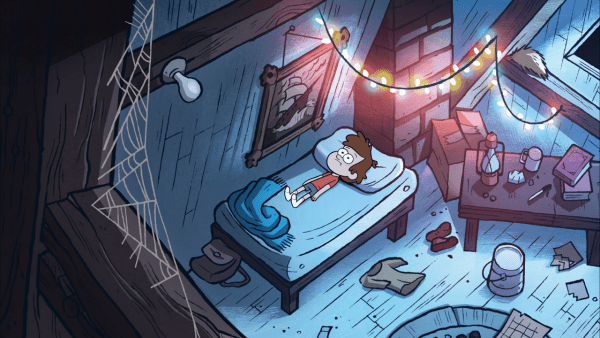 On June 26th, a month before my scheduled surgery, I wake up after having a dream that someone (God or Joan Osborne) whispers to me, “Charlotte, your gallbladder…” as if to shake me awake. My eyes flutter open to the now familiar feeling of a tight chest and shortness of breath. “Am I having a heart attack?” I wonder again, still half asleep. “Charlotte?” Dad answers my call. By now we know the drill. The baby is a veteran of the Emergency Room and so not nearly as enthusiastic about being awakened in the middle of the night. I hunch over on the way to the hospital. Mutter things like “Hurry…Alex…hurry” as the pain and symptoms worsen. They drop me off at the sliding doors and I stumble towards the front counter: “I think I’m dying,” adding this time, “but it might be my gallbladder.” The attendants move like they’re on quaaludes until they notice a nice-looking man walk through the doors holding a baby in a light blue helmet, and their hearts begin to thaw as if they’ve just seen one of those dogs with wheels for legs. “8.” But I want to say 10 and that I could be wrong but I’m fairly positive I’m dying this time. I puke in one of those tiny bags that looks like it was made to pick up dog poop. The baby doubles over in hysterical laughter. Something is different, worse, this time. They put me on a gurney in a small room where I can see nurses laughing heartily and eating fast food. I try to make pained eye contact with them. No response. I am finally administered heavy narcotics. I wait for the pain to dissipate. And I wait. Nothing changes. With furrowed brows, the nurses pile on more meds. Finally, I can breathe. I cannot remember my own name, but I can breathe. Several hours later, out comes my gallbladder. The attending nurse oddly informs me after-the-fact that it looked as brown and rotten as her 75-year old father’s did when he had his removed. According to most doctors, this should have been the end of it. Like Dr. Snowman implied, my body shouldn’t even need a gallbladder! For the past two years, I’ve suffered terrible repercussions from missing this tiny, “insignificant” organ. The worst and most recurrent of these complications involves severe, painful attacks in my upper abdomen – nearly demonic events that present like a cross between a gallbladder attack, a heart attack, and unmedicated childbirth. I’ve gone through numerous tests hoping to uncover the root of these problems. Prognosis: “It doesn’t seem to be cancer.” I’m thrilled by this, but it doesn’t change the fact that I live with chronic, unexplained, and sudden relentless pain – pain that comes without reason or warning, and leaves me completely debilitated. I’ve cut sugar, grains, dairy, and alcohol (#bless) from my diet. I take ox bile supplements forcryingoutloud. Nothing has helped. In the uttermost moments of these attacks, all I hear are God’s words in Jeremiah 30:12: “Your wound is incurable, your injury beyond healing. There is no one to plead your cause, no remedy for your sore, no healing for you.” Disheartened, afraid, angry (and usually bent over a toilet), I take matters into my own hands. I go into survival mode and deliberate: What is this? I can’t breathe. Maybe I should walk around a little. No that’s making it worse. Oh this one’s bad. What if this is THE attack? – The one that does me in? I think I need to go to the hospital. But now we have two babies. Could we leave them here? No, no. They’ll just have to come. Wait, why are my arms going numb? WHAT FRESH HELL IS THIS? Pancreatitis? Or the heart attack I’ve been anticipating?…Oh God, where are you? Is there no balm in Gilead? During these terrifying moments, my blatant and ugly unbelief rises emphatically to the surface, like blackened oil in a stagnant puddle. I wish I could muster enough faith to proclaim, “Heal me and I will be healed! Save me and I will be saved!” But most of the time, I am wrought with doubt and despair. Scripture is rife with divine healing, and yet why won’t God heal me? I feel panicky and pitiful and unable to accept that this is a quality of life I may just have to live with. Sweet Jesus, I am exhausted. I am afraid. I am hurting. A little further into Jeremiah 30 reads, “’But I will restore you to health and heal your wounds,’ declares the Lord.” God doesn’t snap His fingers and do it right then. He says “I will.” He makes a promise. A promise He ultimately fulfills: our wounds were incurable, injuries beyond healing, and so God sent His son to plead our case, to be the remedy for our sores, and to bring ultimate and final healing; by His wounds, I am (we are) healed. Attack or no attack, God has already performed the greatest healing of all. This profound truth doesn’t always feel like enough when I’m staring into the grave with agony. I stand in the darkroom before the metaphorical developing tray and think all’s for lost. The picture – my life – is a total botch. And then God lovingly reminds me of past struggles, pits that seemed impassable, and that He was there all the while carrying me through. So He must be here now, the master craftsman behind my difficult yet beautiful story, drawn tenderly and with loving-kindness. The end of the story has yet to be revealed. But I can almost find joy and humor in the idea that the awful and nagging persistence of my physical brokenness points me day-in and day-out to this real and horrible fact: I am absolutely incapable of saving myself. I just can’t. Maybe that’s enough to cling to for now, one stomach attack at a time. I laughed out at the dialogue in this post. You should write more posts with dialogue. Also you are wonderful. Thank you for sharing your continuing journey with pain. I am also a member of the club, waiting to see when the healing will come. I hope things improve for you, we have to keep holding on to faith. Lord bless you.